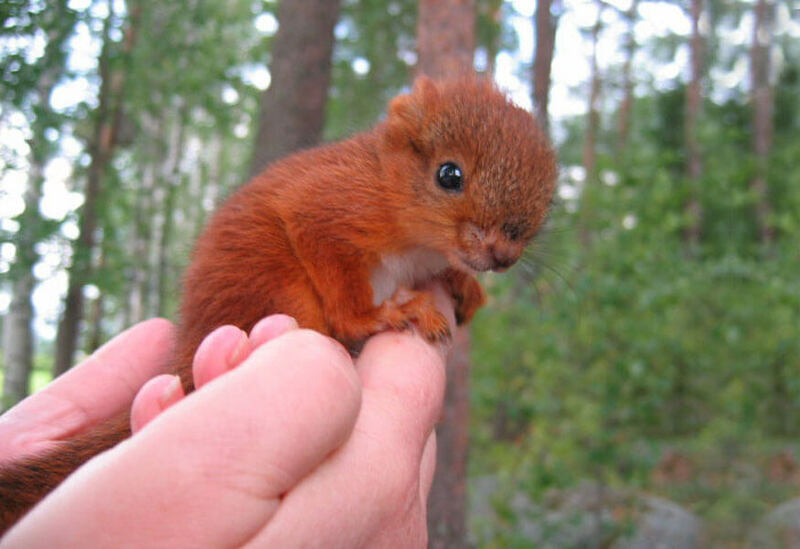 Squirrels are some of the most adorable creatures in the animal kingdom. It makes sense that any human with a decent heart would want to help one if it were in trouble. 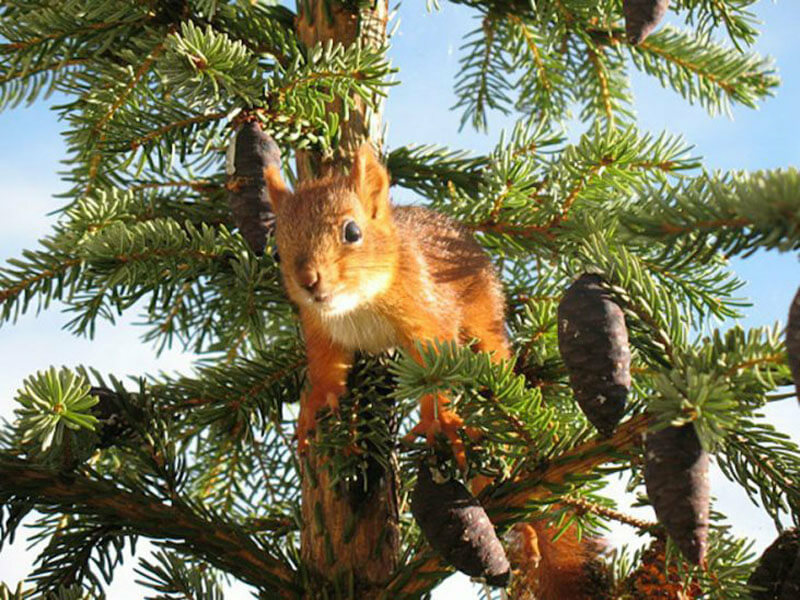 One family in Finland noticed an innocent red squirrel that was nearly lifeless on the side of the road. The family was distraught at the sight of this, but then the little creature showed signs of life. It was the start of a beautiful journey that went from gut-wrenching to heartwarming. 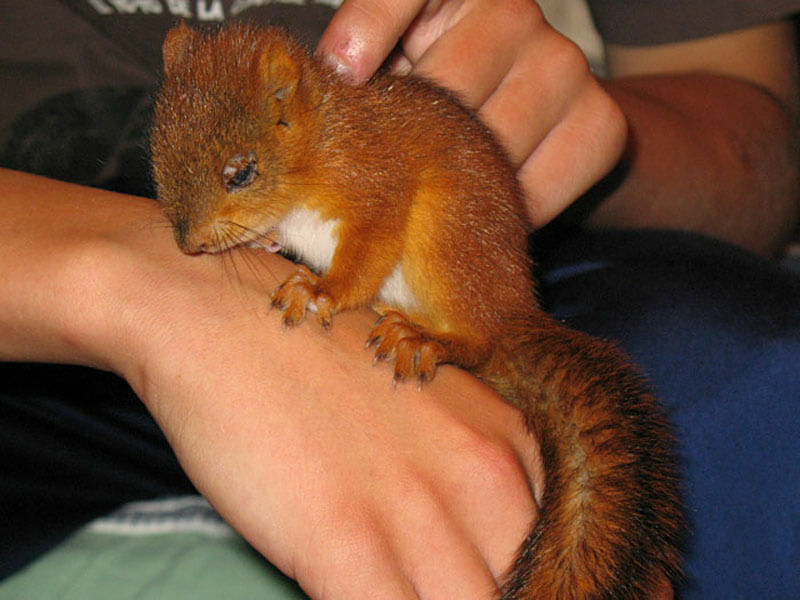 A family from Finland spotted an innocent little red squirrel on the side of the road back in 2007. There were no signs of life. They wondered if it had been struck by a car or maybe even attacked by another animal. The family was heartbroken. 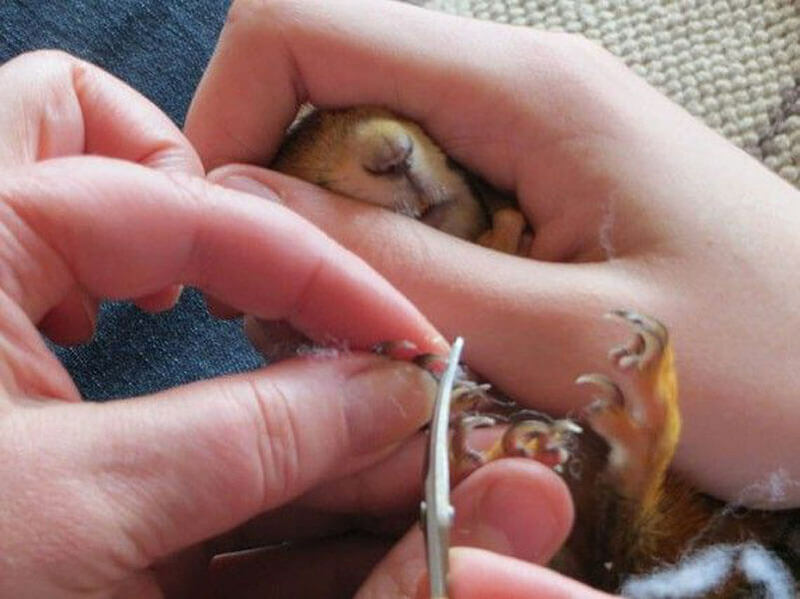 They had never come across a baby animal in more need of help. They were determined to do whatever they could to help him survive the condition he was in. Their first decision was to take the poor little guy home with them so they could attempt to nurse it back to health. As a caring person, it seems like the plausible thing to do in that situation. 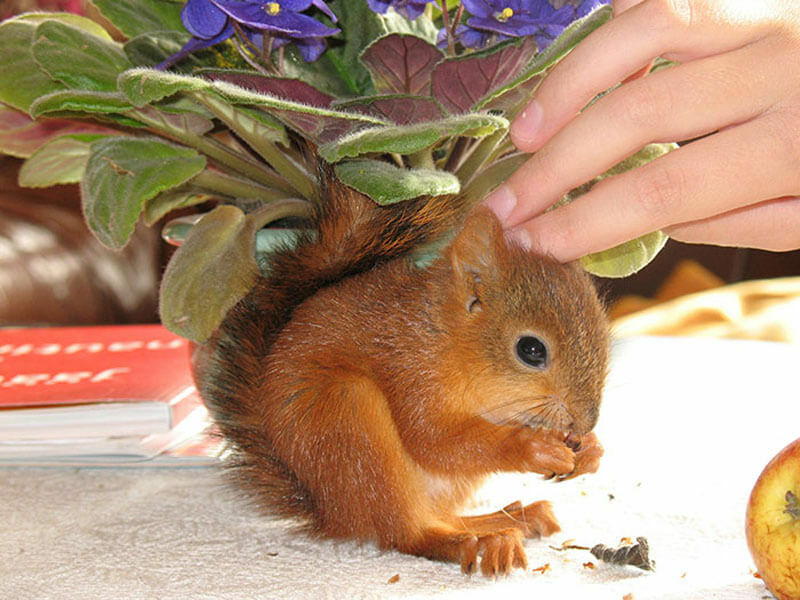 Much like many things in life, there is nothing a little bit of tender love and care can’t fix. The family put in overtime to make sure the little guy was getting the proper attention that he needed. It wasn’t long until he was eager and fascinated with his new surroundings. The family was ecstatic and couldn’t get enough of watching what he would do next. It was like he was reborn into the world. As sweet as it all was looking, everything that glitters isn’t gold. 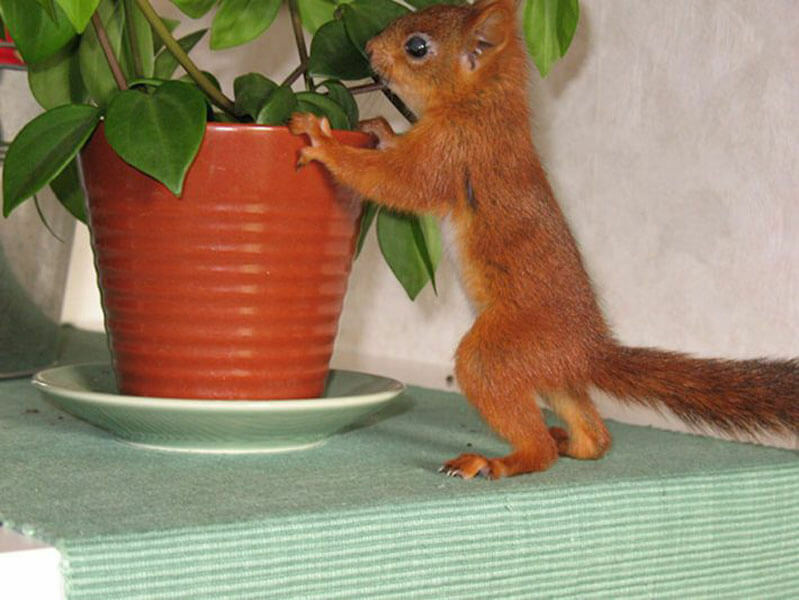 The love and care provided by the family was enough to bring the squirrel back to a healthy state, but there was something wrong. The happy ending everyone that hoped for was muddled by a discovery. 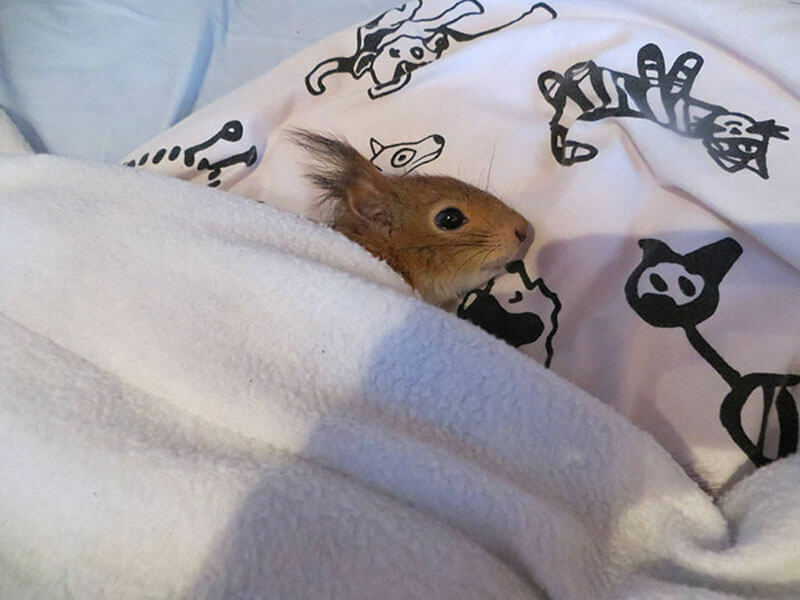 “We realized that his eye would never heal completely and he wouldn’t survive on his own,” said Reddit user Priami, whose family adopted the squirrel. What did that mean for our little friend’s future? Naturally, the family was heartbroken to learn that their new pal would never be able to return to his natural habitat. However, there was a silver lining to that discovery. They were more than happy to bring in the critter as one of their own. He was practically already family to them, so what harm would it be to have him turn into a full-time family member? They just couldn’t let him go and who could blame them? They made up their minds. 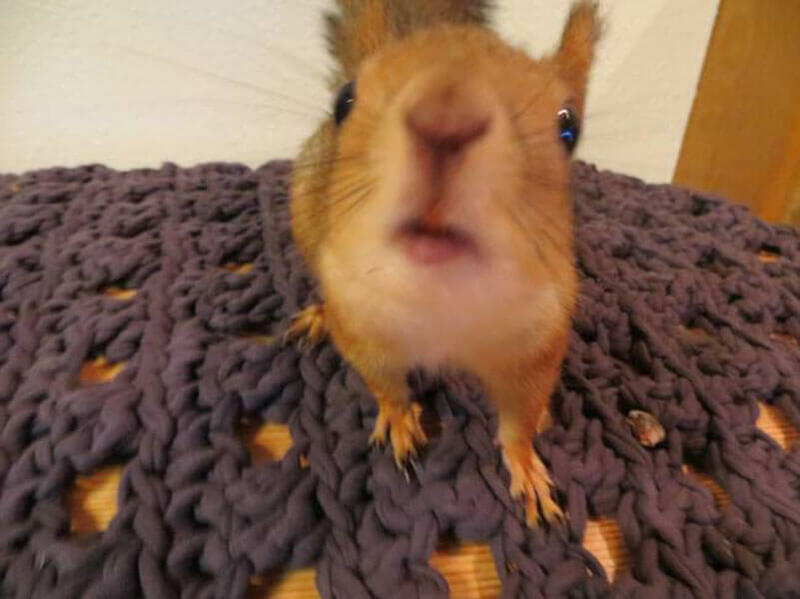 The family finally decided to make the squirrel a part of their life by officially adopting him. The next step was to decide a name for their furry little guy. 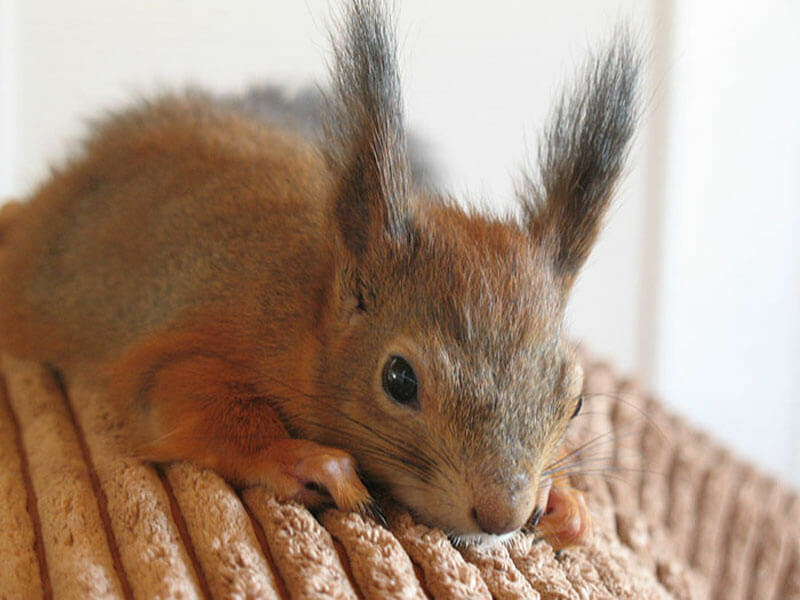 What name would be best suited for a squirrel do you think? Maximus? Arthur? Maybe even Daniel? They decided to go with Arttu, “pretty much the Finnish version of ‘Arthur. '”That name ended up fitting him so well. Big things were in store for little Arttu. Once they decided on a name, the next step was to make sure Arttu was nice and comfortable at his new place of residence. Much like when a friend comes to visit, you want to make sure that he or she feels good during their stay. Since this was a permanent stay, and because he was an animal that usually isn’t domesticated. It wasn’t long before they found out that Arttu had quite the personality. Who would have thought that squirrels could be so funny or have a sense of humor? Clearly, no one, but Arttu was such a jokester according to the family. 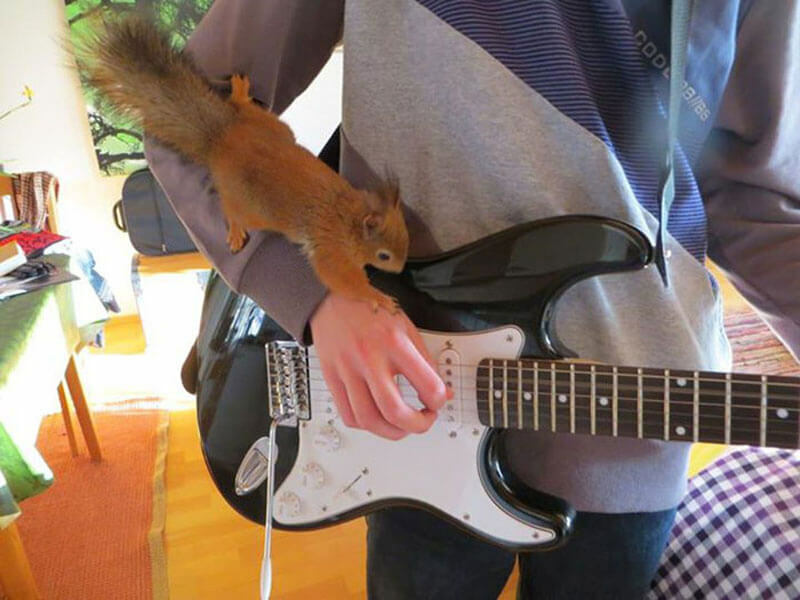 He would do things that you wouldn’t expect animals to do. “He liked to have playful ‘fights’ with our hands (you know, like cats do) and he was smart enough not to bite too hard,” his new family said. You just have to love an animal with a playful side. It was like a dream come true for Arttu and his human family. He had a blast all day and every day. The family loved his presence as much as he loved playing with them. 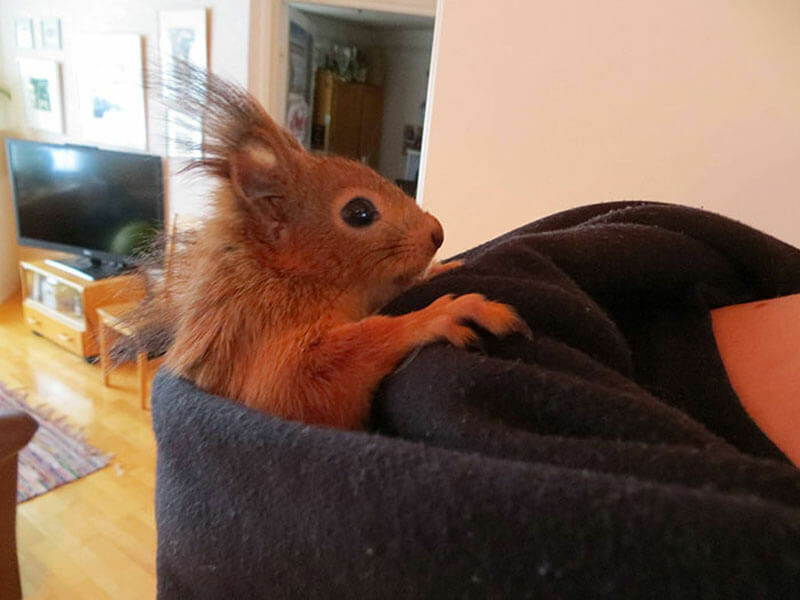 In the moments when Arttu wasn’t climbing all over the humans, he would make the most out of their hoodies. 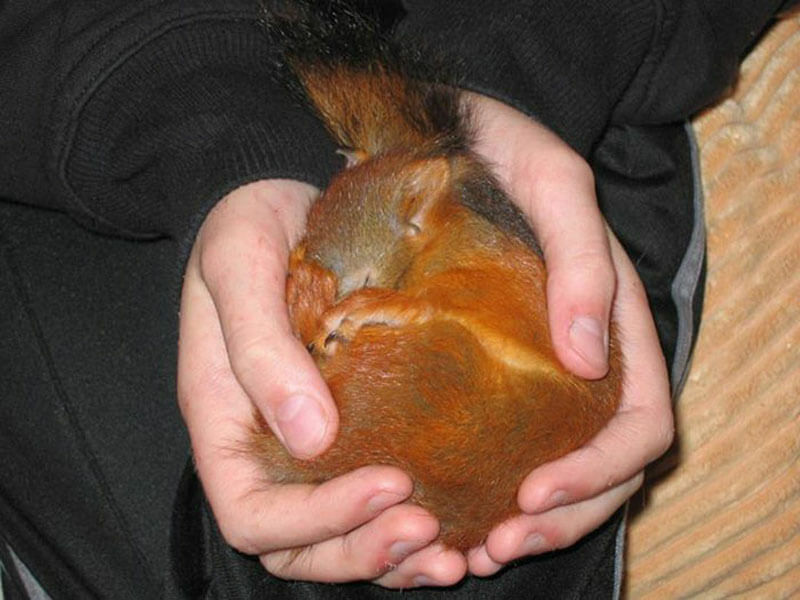 One thing he would do is nestle into them and make temporary nests so he could be nice and warm. Not only was Arttu a funny guy, he had a tremendous appetite. 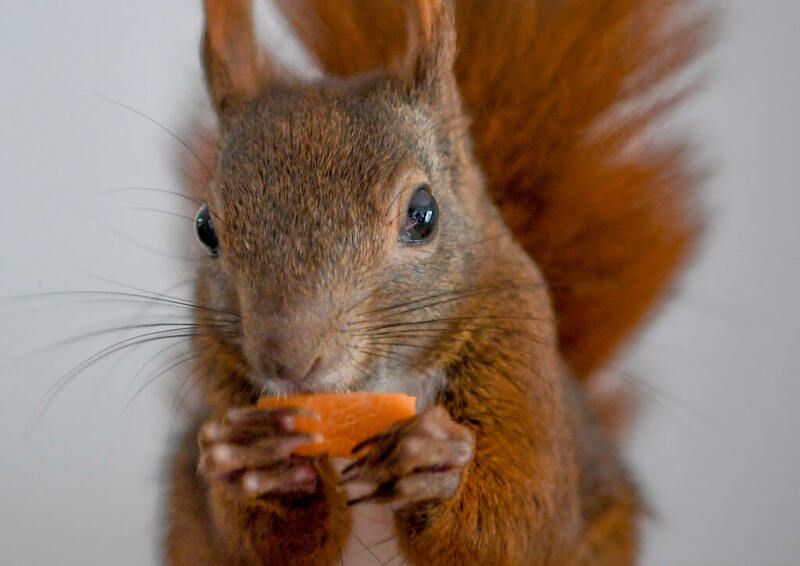 When you’re spending most of your time wasting energy climbing up people five times larger than you, you will be hungrier than the average squirrel. To solve this, the family tried many different snacks to see which he would like the most. They were pleased to find out he liked to eat well. They gave him a diet of nuts, fruits, berries, and mushrooms. This little guy just loved being around everyone. It was like he was meant for domestication. He liked munching on his snacks outside with the rest of the family while they enjoyed each other’s company. Obviously, he couldn’t spea, but he made it clear with his presence that being around his humans was something he did enjoy very much. He loved every minute spent with them and the family loved every minute with Arttu. Wild animals and humans don’t normally blend that well. It just isn’t in their nature to be buddies with people and that’s common knowledge. However, the exact opposite could be said for Arttu and his family. He had become extremely comfortable with them. Comfort became instinct with Arttu. No matter where or when, Arttu was able to transform any place into a cozy resting nest that was perfect for his next nap. The hoodies are where it started, but that soon became cupped hands too. It’s unfortunate that Arttu couldn’t roam around the great outdoors like the rest of his species. Climbing huge trees, finding food, and jumping from branch to branch wasn’t in his daily life anymore. However, his family helped with that issue. They really enjoyed taking him outside so that he could climb around as nature originally planned for squirrels to do. As long as he had the proper supervision, everything was fine. Look how happy the little guy looks! Imagine being stripped away from your native country but accepted elsewhere wholeheartedly. As good as it is to be accepted, there will always be a part of you that might miss where you came from. Arttu’s family wanted to make sure this didn’t happen with him. Whenever it was time for Arttu to come back inside after playing, they let him feel close to his home. That’s right, Arttu was allowed to bring back in something from nature. 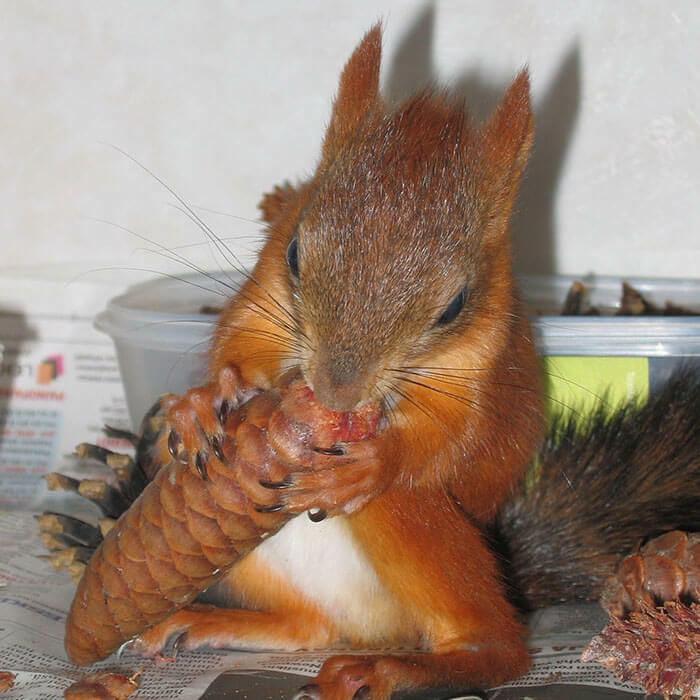 His favorite was pine cones! 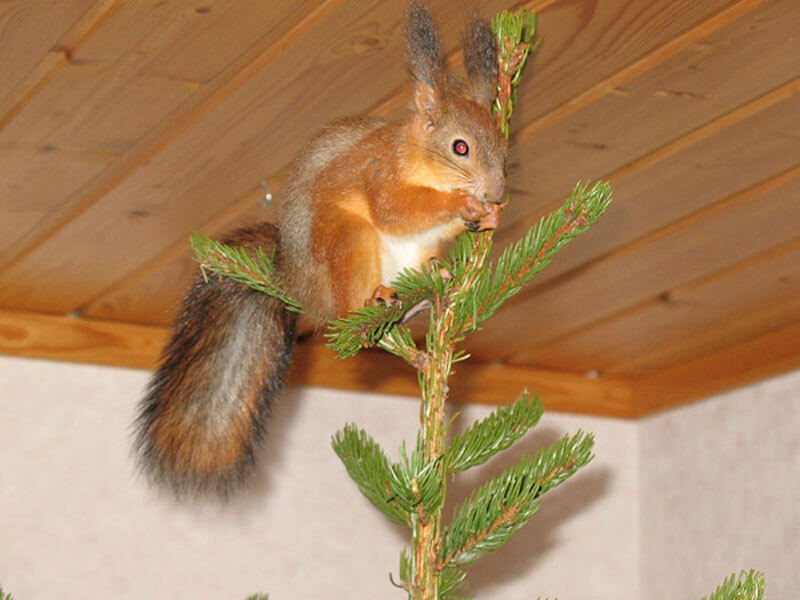 Can you imagine having a little furry tree climber roam around your house during Christmas time? 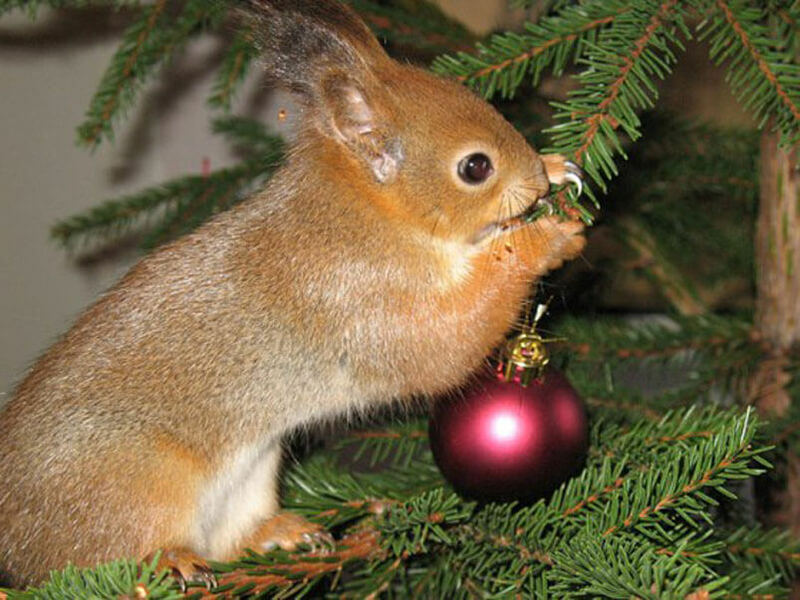 There’s no telling what he might do around the Christmas tree! That’s why whenever that holiday came around, the family ensured that the tree was extra protected. It was only a matter of time before Arttu would climb to the top of the tree! That was just in his nature as a wild animal. What else would you expect? 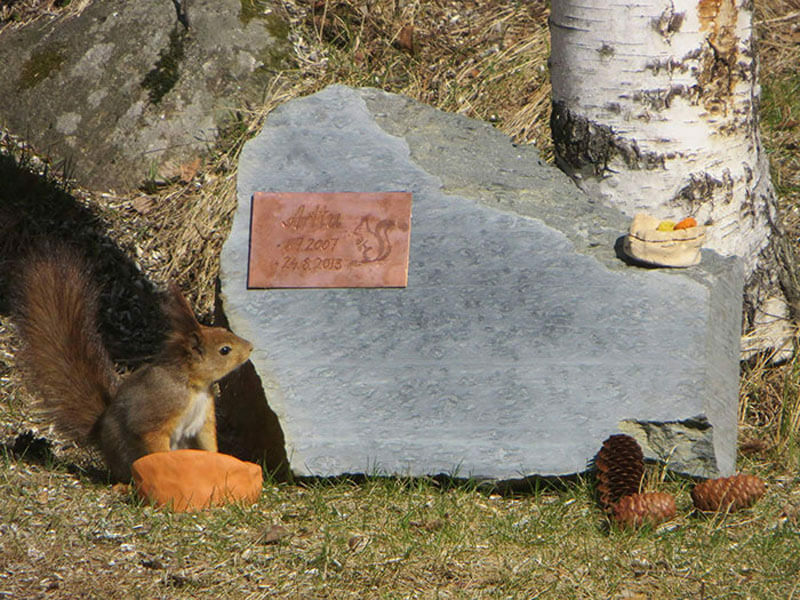 As it turns out, Arttu was smarter than your average squirrel. That’s something you might never hear in your life, but it could be said for this little guy! Although he liked climbing, he soon began to realize something important. Trees inside the house were way different than the ones he found and loved outside. And he may have realized this, but that didn’t stop him from appreciating the ornaments found on the Christmas tree. A cat or dog is usually the standard type of pet to keep. That means animal stores and groomers are better suited to tend to those kinds of animals than, say, a local squirrel you found on the side of the road. 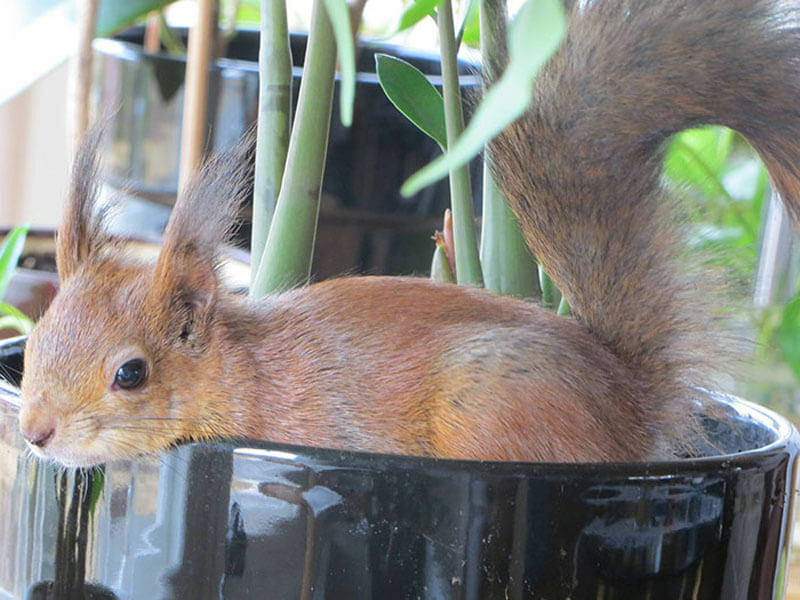 A squirrel has a special set of challenges that come along with the unique joys they bring. Arttu needed to have his nails regularly trimmed due to not living in the outdoors. That itself was quite a task. Have you ever seen those videos on YouTube where the owner is attempting to groom their cat, but the cat just isn’t cooperating? That happens with a lot of pets and it’s expected. Don’t expect it with Arttu. Many other animals act out of character while they are getting special treatment, but Arttu takes it like a real trooper. He understood the better he acted, the sooner it would all be over with and he could get back to acting like is playful self. From 2007 until 2013, Arttu lived with his human family. That is a long life considering all that he has been through for such a small animal. The day came where he ended up passing away due to old age. 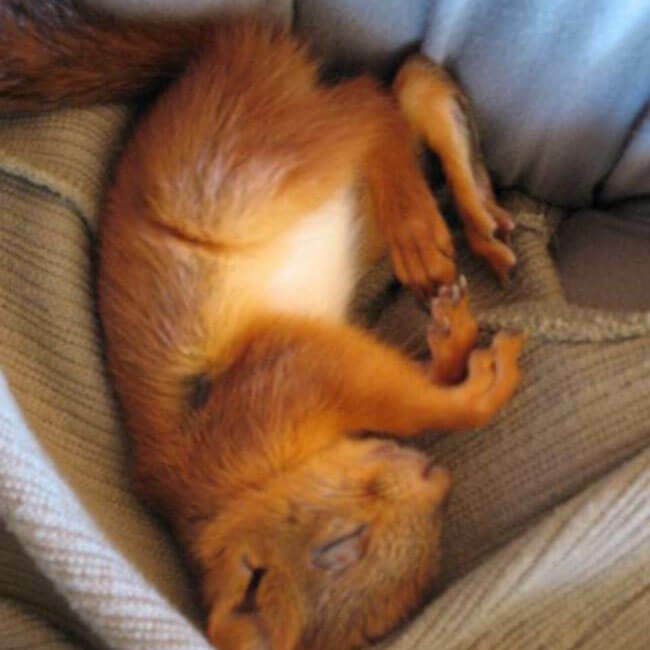 The family found him curled up in a nest looking like he was sleeping. Once they realized he wasn’t alive anymore, it was difficult for the family to come to terms with the fact their unexpected family member was gone. No matter how short his life was, Arttu certainly had one for the ages. Neither he or the family could have ever predicted that they would be living under the same roof in unity like they were. It was like something out of a Disney movie. The family did something touching for the little guy. 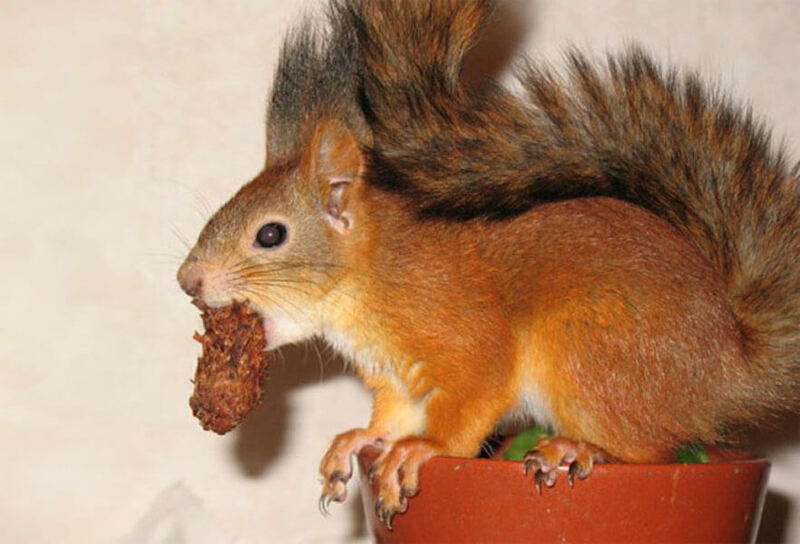 “We fed other squirrels all the food we had stored for him before he died,” they said. They even gave Arttu a little tombstone. 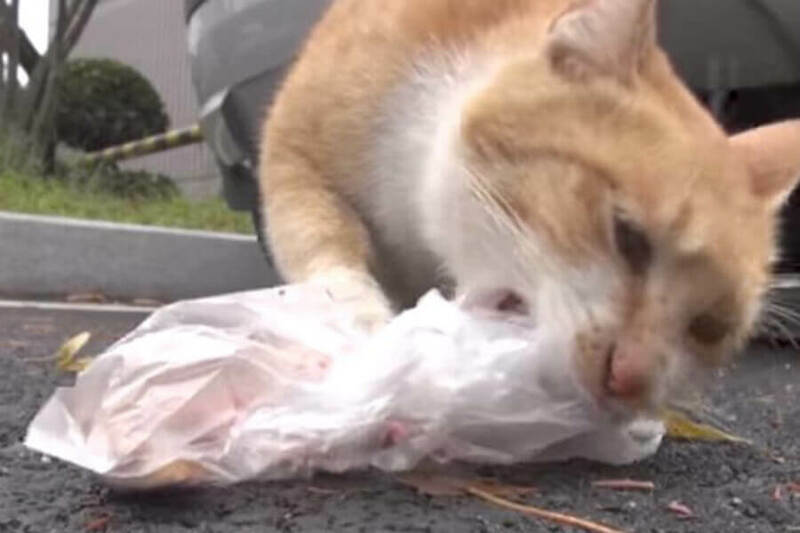 Keep going to read the incredibly touching story about why a cat would only take food in bags. Making a difference in the lives of animals can be a heartbreaking chore. 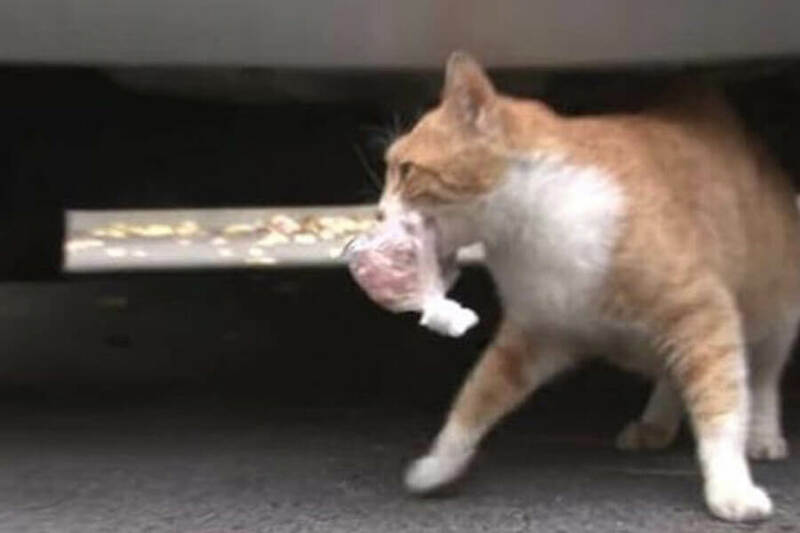 That was true for one unnamed Korean woman who made it her job to feed all the feral cats in her neighborhood. As a volunteer at a local shelter, she had access to food, and she decided to put it to great use. 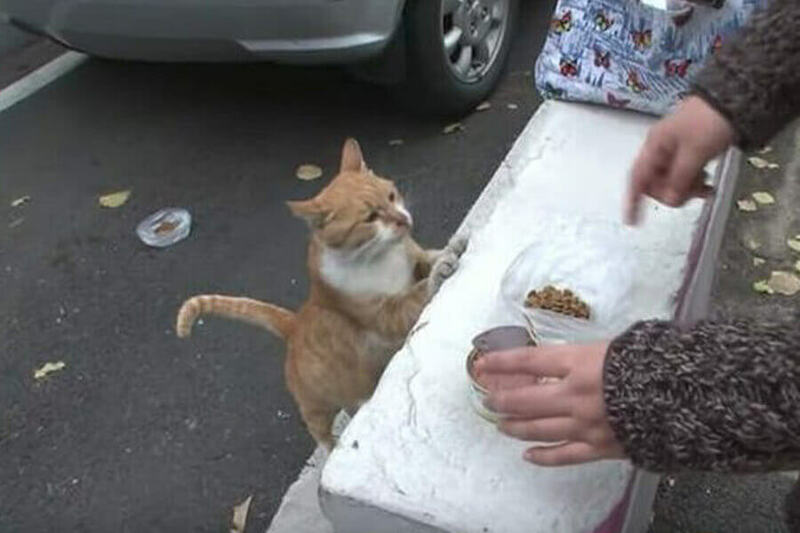 For five years this volunteer would hand out food in bowls to every homeless cat who would accept her offer. For the most part, all of the cats happily took the free meal. One cat, however, stood out from the rest for one crazy reason. 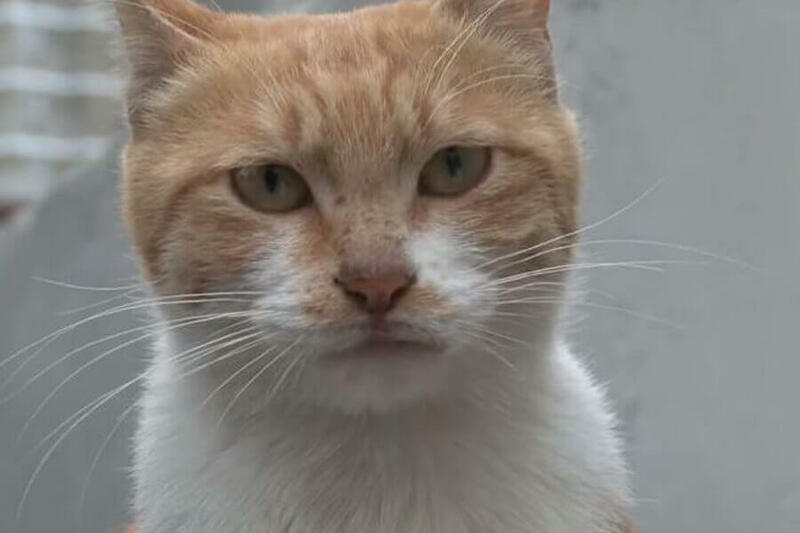 The cat, which was named Dongsuk, would show up every day for food with the rest of the cats, but would never take any. Instead, the furry feline would turn away, choosing to find a way to survive by other means. Still, Dongsuk showed up every day, proving she wasn’t averse to getting a free meal. She just didn’t like the food she was being given. Or, as the volunteer began to think, maybe it was about the way the food was being presented in the first place. Was there a reason Dongsuk refused to eat from bowls? The Vounteer’s first instinct when she discovered Dongsuk refused to eat was to switch the kind of food she was giving the cat. 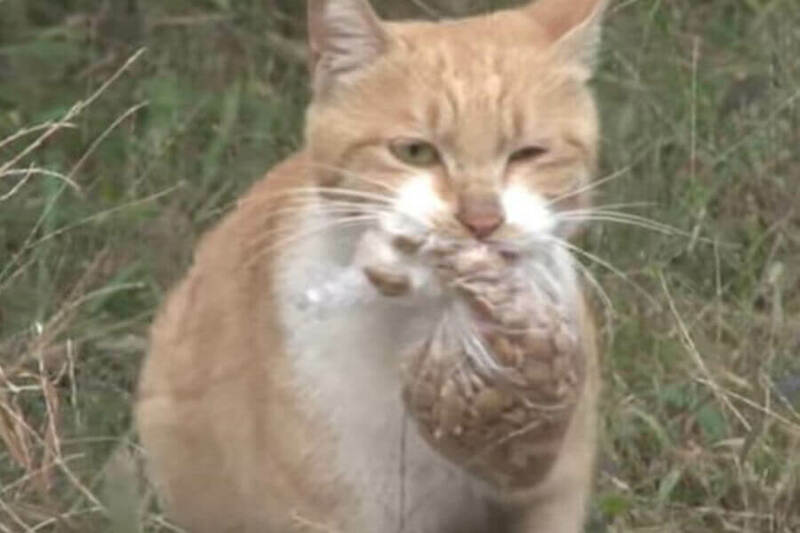 Cats tend to be very picky about their diets, even refusing good food when it’s not the type they prefer. To test if Dongsuk was this kind of cat, the volunteer tried several types of dry food. Dongsuk refused every brand and every variety. Then she tried wet food in a can. Dongsuk remained stubborn, forcing the volunteer to go back to the drawing board. Maybe Food In Bags Will Do? Desperate to solve the mystery of why Dongsuk wouldn’t eat, the volunteer began to think out of the box. Like we said, if Dongsuk didn’t want the food, she wouldn’t show up to feeding time everyday. It was up to her new friend to learn how to feed Dongsuk so she wouldn’t starve. With so many questions, where would the volunteer find the answers? The volunteer was ecstatic that Dongsuk was finally taking the food. Every day she would make sure there was a special bag of cat food ready for the felines. And every day, Dongsuk would come to visit, take the bag of food, and run off. This odd behavior, however, only made the volunteer more curious about where Dongsuk was going with her bag of food. 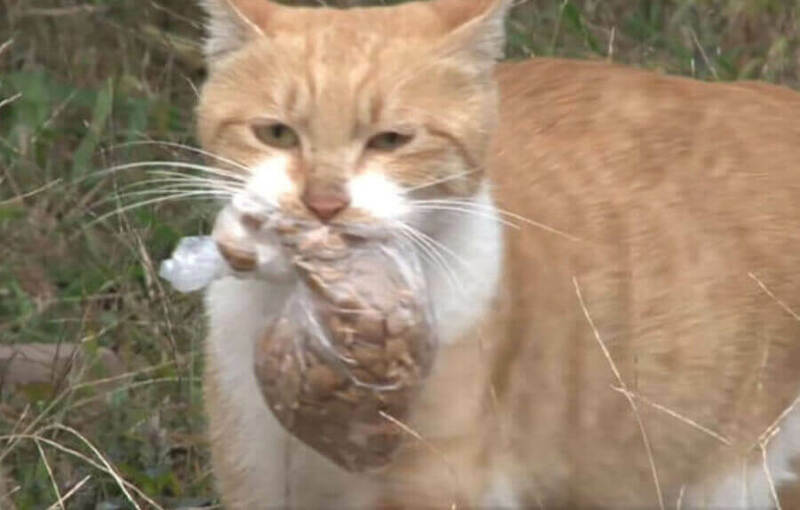 She already thought it was odd the cat would only accept food in a bag, and now she needed to know why. Why Would Dongsuk Only Eat Food From A Bag? First of all, the volunteer didn’t understand why Dongsuk wanted to eat her food from a bag. Wouldn’t a bowl be easier? Did Dongsuk really prefer living her life the hard way? If so, then why? There were so many questions the volunteer needed to be answered! She also knew there had to be an answer. Taking advice from her friends, the volunteer gave into her curiosity and began to come up with a plan to unravel this new mystery. She never expected to the truth to be so heartwarming. Where Did Dongsuk Take Her Food? 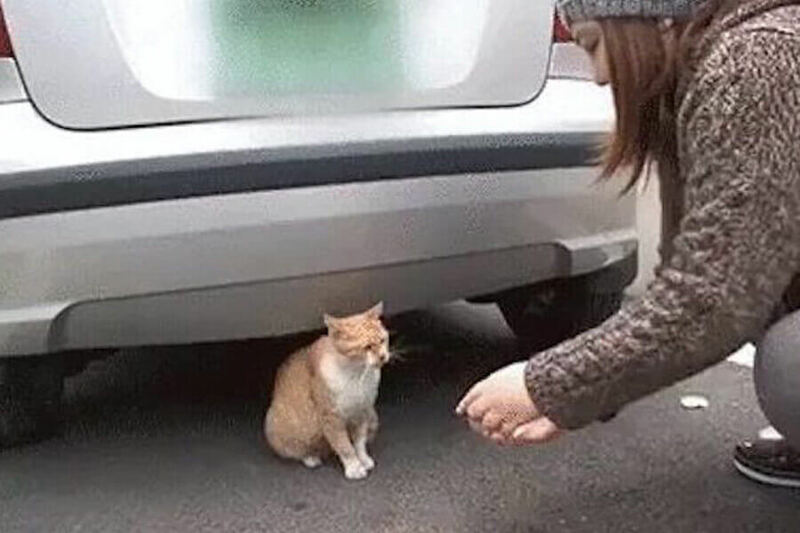 Cats have some strange behaviors, but the way Dongsuk acted worried her volunteer. One of the biggest questions she needed answered was this; where was Dongsuk taking the bag of food? Originally, she assumed Dongsuk preferred to eat in private. But why? Most of the cats ate in front of her without hesitation. Perhaps Dongsuk didn’t trust humans and found just enough courage to show up every day for food and scurry off. Perhaps there was another, more important reason. Up next, the volunteer makes a plan to learn the truth! One day, to solve the mystery that Dongsuk had created, the volunteer banded together with a few of her friends to follow the cat. The mission wouldn’t be easy. They would have to keep their distance to keep the skittish kitty from running. If they were caught, it could be disastrous. It took so long to earn Dongsuk’s trust in the first place, what would happen if they broke it? How would they know if Dongsuk was still eating and alive? The food they provided was Dongsuk’s main source of food, and they were determined to keep it that way. Keeping their distance, the team followed Dongsuk on her journey with her bag of food. The further away from the neighborhood Dongsuk took them, the more baffled they became. Something was urging Dongsuk to make this incredible journey everyday, and they were close to finding out why. Finally, Dongsuk arrived, with the team in tow, at the entryway of an abandoned building. The scene couldn’t have felt more like the start of a scary movie. Luckily, there were no horrors found inside the building! Dongsuk took the team inside the building, where she put the bag of food down and began to pace. Don’t worry, the cat wasn’t summoning anything scary. In fact, she seemed scared herself. The way she was walking back and forth nervously, the team knew she wasn’t comfortable. It’s possible Dongsuk didn’t want to eat in front of the team. At this point, the cat had to know that the group of people were following her. They believed she might have been showing that she was ready for them to leave. Still waiting, Dongsuk began meowing. At this point the team realized she was waiting for something. In a few seconds they found out a what. Out of nowhere a little ginger kitten appeared and ran right up to Dongsuk, who put down the bag of food. Dongsuk was a mom! 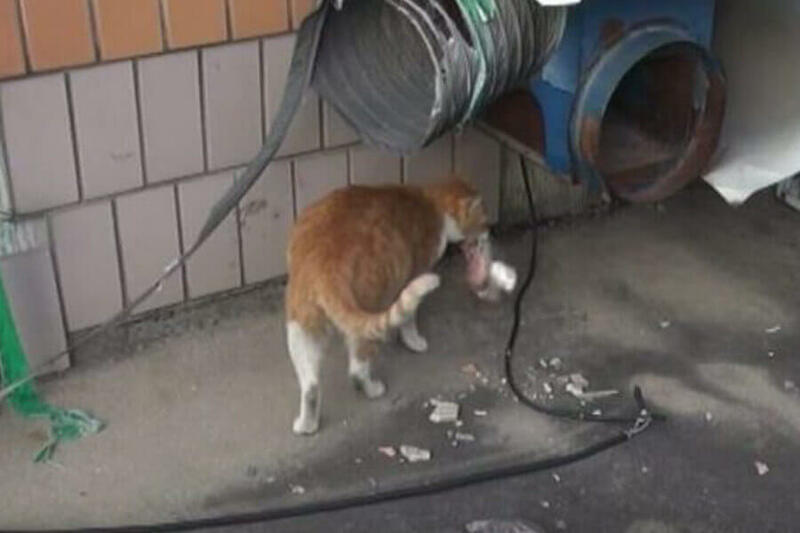 Every day she made sure not only to provide for herself but for her young kitten as well. This is why she would only take food wrapped in a bag. It was the only way she could ensure her baby would be fed. 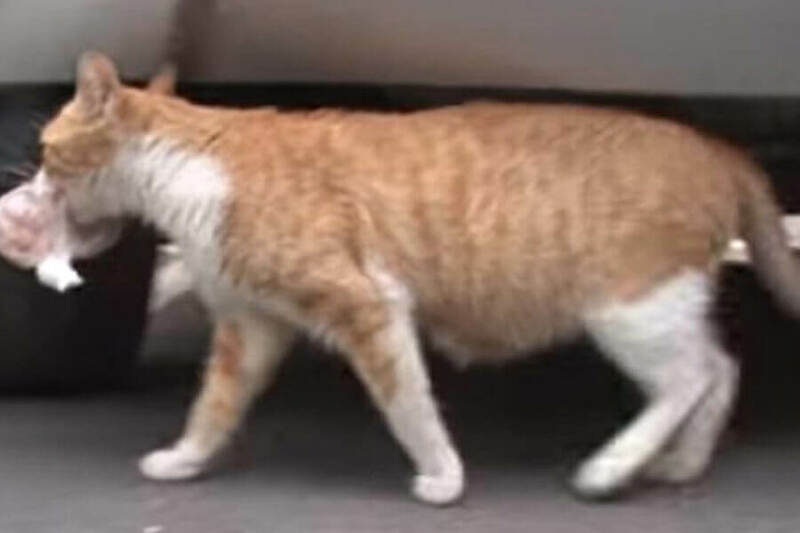 The volunteer and her friends continued to watch the selfless acts of this feline mother unfold. After Dongsuk put the bag of food down, she stepped away, letting her daughter eat first. The kitten ripped into the bag and fed til it was full. Finally, after her daughter was happy, Dongsuk enjoyed her meal. The team was brought to tears as they watched this real life story of heroism and survival unfold right before their eyes. Of course, the story didn’t end there. Keep reading to find out what amazing thing happened next! Having witnessed everything Dongsuk was willing to go through to make sure her daughter was fed, the volunteer and her team knew they needed to do something as well. First, they checked the neighborhood to see if anyone knew Dongsuk, and had been looking for their lost cat. No one claimed ownership of the feral cat, confirming she was on her own and had been on her own for a long time. Sadly, there were some people in the neighborhood who were familiar with Dongsuk, and they had a heartbreaking story to share. As the team went around the neighborhood and interviewed people, they learned that Dongsuk had suffered a major tragedy in her past. 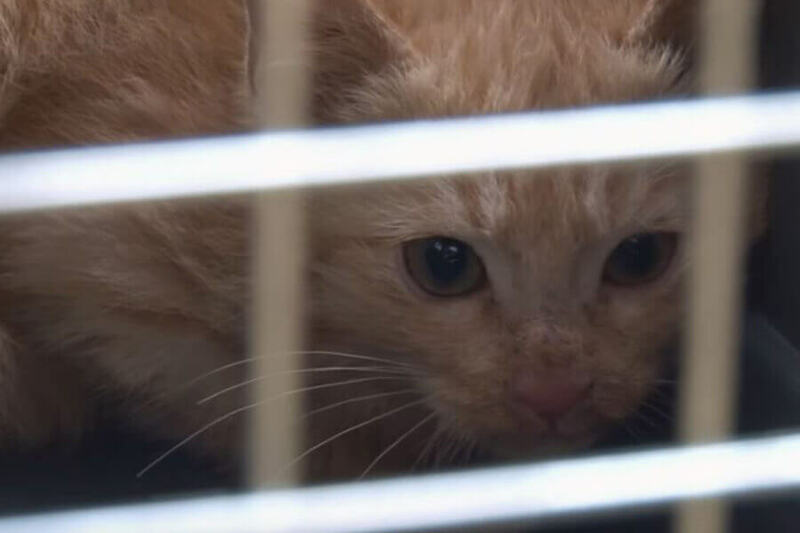 According to someone they spoke with, the mother cat had originally given birth to five healthy kittens. Life hadn’t been fair to Dongsuk, and as she fought to keep her litter alive, she lost four of them. Now her daughter was her entire world. She had one baby left and was determined, no matter what, to keep her alive and watch her grow up into an adult cat. Now she just needed a happy ending. Still ahead, learn all about the team harrowing rescue mission! 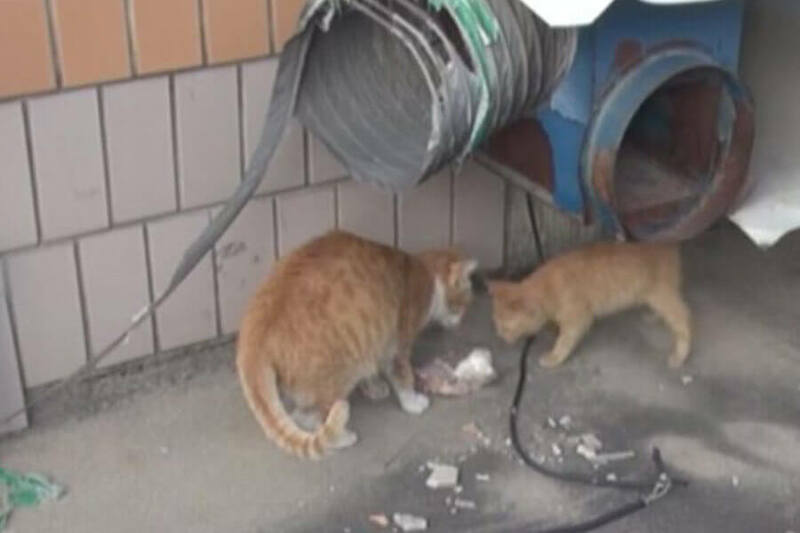 The team knew they wanted to find a way to rescue Dongsuk and her kitten, but they also knew they needed to form a stronger bond of trust. To do this, they returned to the location Dongsuk led them to and gave her a blanket. The blanket was the first step in building a trusting relationship between cat and human. It was used to show that these people weren’t the enemy. Still, Dongsuk and her daughter weren’t going to give away their trust in a day. 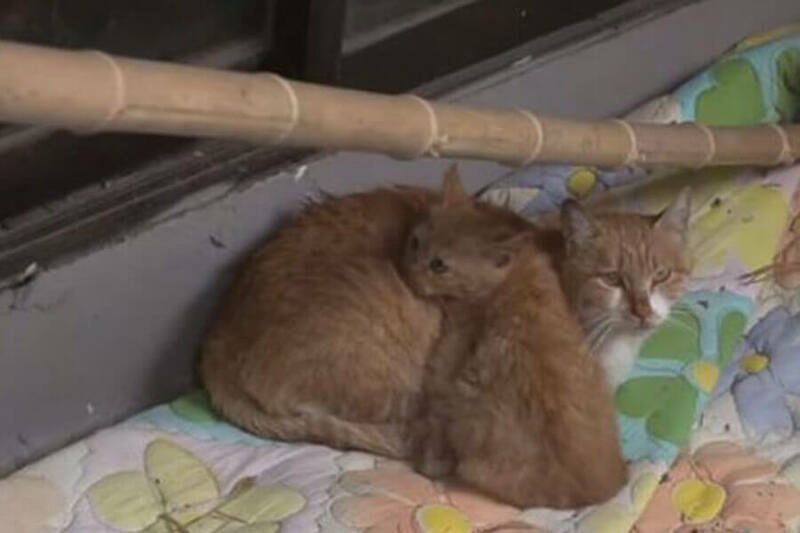 After giving Donhsuk and her daughter the gift of warmth, the team of volunteers returned to the building every day to allow the cats to feel normal around humans. According to one of them, Dongsuk came on board pretty quickly. Dongsuk’s daughter was less willing to make friends with her human saviors. Remember, she was not able to build a previous relationship with them. Dongsuk had used them as a trusted food source, but her daughter had no idea. She just ate the food after it was brought to her. 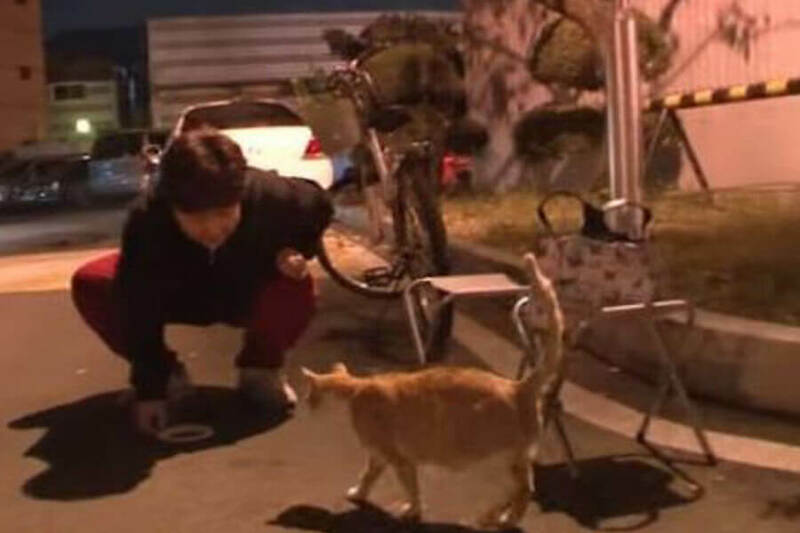 The team was used to needing patience, and knew that with the cats fed everyday they could be patient waiting for Dongsuk’s daughter to warm up to them. They knew the cats were fed, they just wanted to make sure were safe. Eventually, the tiny kitten became comfortable with the humans. Even if she didn’t like them very much, she seemed to understand that they were there to help and not hurt her. With the trust of both cats, the volunteers knew that the next step was going to be moving them to a new home. One of the big reasons the team was willing to take so long to earn the trust of Dongsuk and her daughter was the rescue mission. 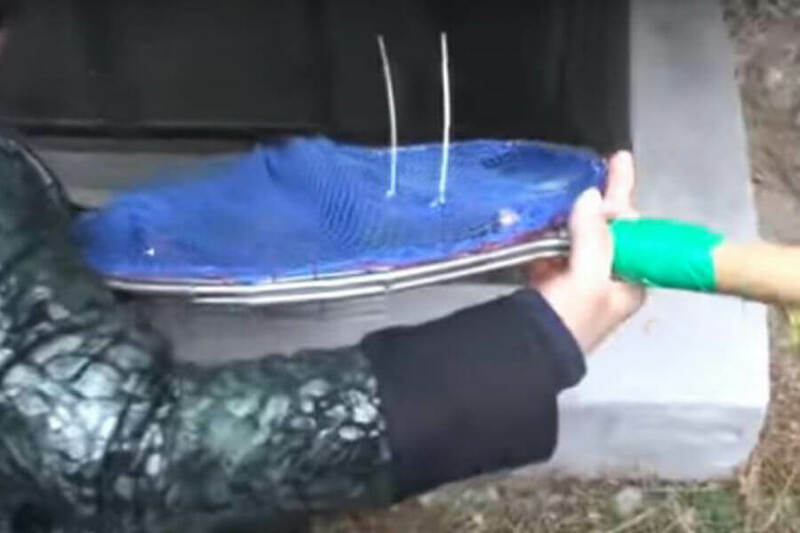 In order to move these cats to a new home, they needed to use scary tools and nets. 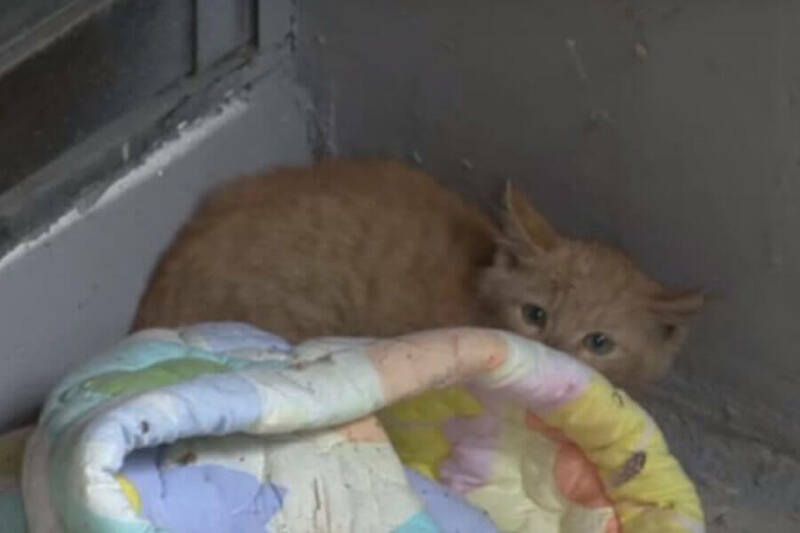 The cats were still feral, so it wouldn’t have been safe to pick them up and move them. As much as the volunteers may have wanted too, they still needed to be safe. Looking at the net above, you can imagine what would have happened hadn’t they built trust with the animals first. Before Dongsuk and her daughter were adopted, they were taken to a shelter where they were given their own mini house. As you can see, it was way more luxurious than their last home. They even began eating their food and drinking their water out of bowls! 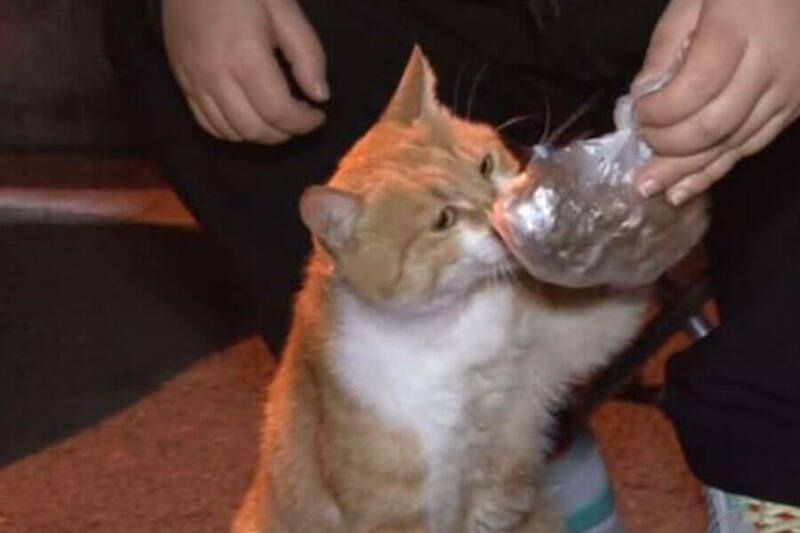 Life was looking up for the cats from the streets. Now she just needed to find a forever home. It was also clear that it was important to keep the two felines together. The story of Dongsuk and her daughter is one of the most inspirational rescue stories we’ve heard. 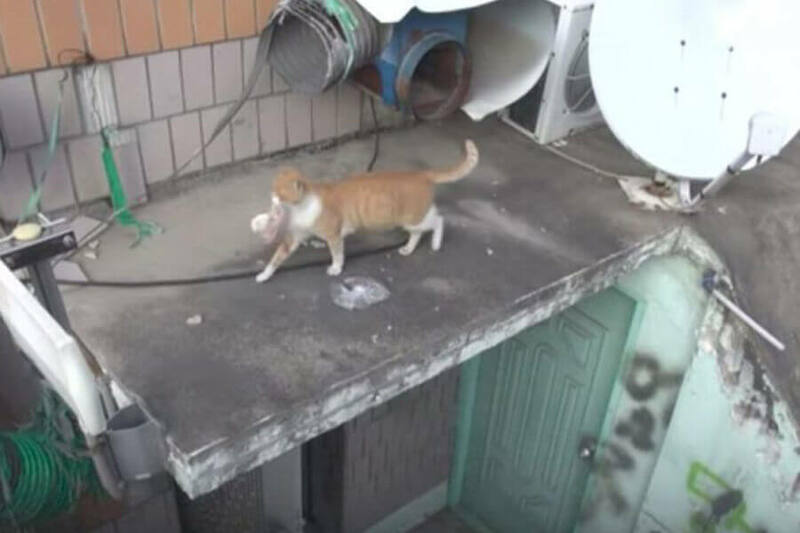 The resilience it took for this cat to put her kitten’s welfare ahead of her own is incredibly touching. Especially after having gone through the tragedy the poor thing went through with four other kittens. This is a story of motherly love and the power of doing good. The volunteer and her team went above and beyond their duties to save the day as well. 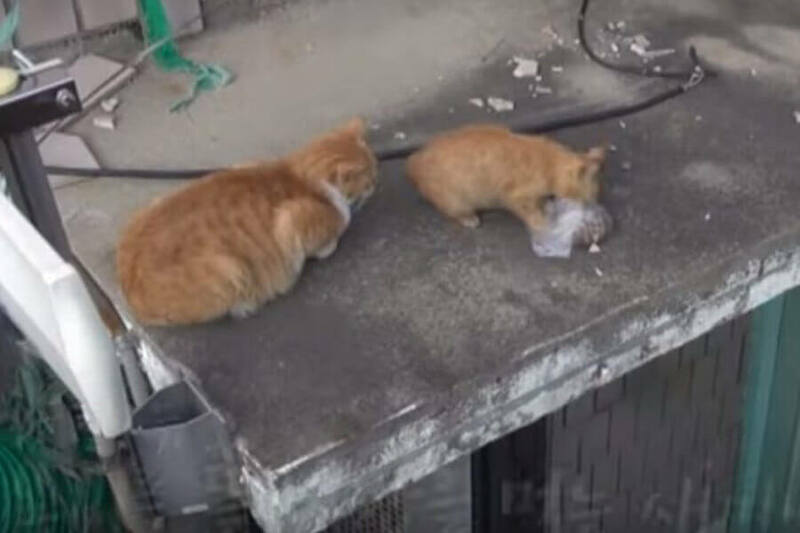 They set out to feed the cats and ended up giving two cats in need new leases on life.